PHOENIX--(BUSINESS WIRE)--According to news reports, Hurricane Harvey has driven more than one million people from their homes in Texas, displacing thousands of pets in the affected areas. In response, PetSmart Charities is doubling its initial commitment of $1 million to $2 million in grants to support animal welfare organizations working on the front lines to help pets and pet parents in need. PetSmart Charities, the leading funder of animal welfare in North America, is committed to helping pets in need and connecting pets and people, including situations of natural disasters, such as Hurricane Harvey. While prominent rescue organizations are focused on important human relief efforts, PetSmart Charities knows that providing assistance for pets is critical too, as many pet parents will go to great lengths to save their four-legged family members. 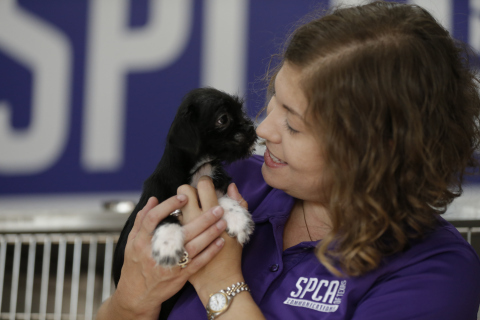 $50,000 to Spay-Neuter Assistance Program (SNAP), Inc.: To support pet parents that were forced to leave their homes, SNAP is providing immediate veterinary services to pets affected by Hurricane Harvey in evacuee centers located in Houston and San Antonio. Services include medical examinations, microchips and procedures to treat skin infections and respiratory issues common following floods. $25,000 to Humane Society of Southeast Texas: Located in Beaumont, a town that experienced severe flooding and now has limited access to clean water, the Humane Society of Southeast Texas is supporting Hurricane Harvey relief efforts by providing assistance for shelter and community pets in need. $25,000 to Friends of Austin Animal Center: Funds donated to the Austin Animal Shelter will be used to support up to 8,000 evacuees from Southeast Texas who are at the City of Austin Expo Center. In addition to providing funds, and continuing to assess the funding needs going forward, PetSmart Charities is coordinating deliveries of pet food and supplies to organizations working in the trenches. By week’s end, the nonprofit will have delivered more than 110,000 pounds, or 55 tons, of pet food donated through PetSmart’s philanthropic Buy A Bag, Give A Meal* program and coordinated at least 10 truckloads of pet supplies, including crates, collars, leashes and pet beds and kitty litter to the affected areas. If you are an animal welfare organization spearheading rescue, relief and recovery efforts for those affected by Hurricane Harvey, please visit www.petsmartcharities.org/pro to apply for an emergency relief grant from PetSmart Charities. If you would like to support PetSmart Charities’ emergency relief efforts, like those underway in Texas, please consider making a donation at the PIN pads located at the cash registers of every PetSmart store or online at www.petsmartcharities.org/donate. For more information on PetSmart Charities, please visit www.PetSmartCharities.org. *Ends 12/31/17. 5 oz. dog food, 1.5 oz. cat food donated to PetSmart Charities to feed dogs and cats in need. See details at petsmart.com/giveameal. The actual number of meals donated is based on dog and cat food bags sold. The meal donation estimate is based on historic sales for similar time periods. No guaranteed amount. 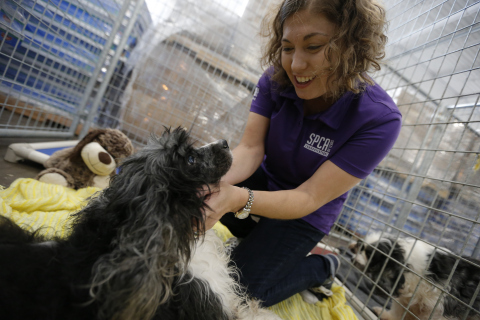 Rescue Bank and Feeding America will help distribute a large portion of the pet food donation in the U.S., while four large animal welfare agencies will distribute it in Canada.